Of course change is hard, and after writer Brian Buccellato and especially writer/artist Francis Manapul's multi-volume run on Flash, the next creative team is most assuredly going to fight an uphill battle in Flash Vol. 6: Out of Time. I appreciate incoming artist Brett Booth's work, but it's significantly different than Manapul's; I don't think DC Comics has quite found the right book for Booth yet, and I think replacing Manapul with Booth on Flash reflects a misunderstanding of what audiences want from a Flash book. I give new series writers Robert Venditti and Van Jensen points for creative use of the Futures End tie-in issue, but this is a fairly short story spread over eight issues, and dedicated more to set-up than anything else. I feel I'll need another volume to know if this is just a slow start before something better or if this is how this new team's Flash run will go. Out of Time's conceit is that the future Flash Barry Allen is traveling back in time to correct the mistakes in his life, culminating with killing his own past self to fix a wound in the Speed Force. That's a fine story idea, but the future Flash doesn't arrive to "now-ish time" until about the second-to-last chapter of this eight-issue collection. 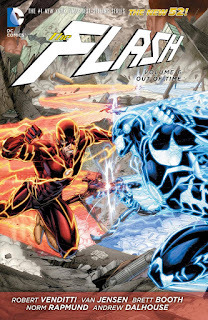 The other issues are taken up, formulaically, with the future Flash visiting a crucial moment in the lives of his major rogues, one per issue, and meanwhile the present Flash tracks down weapons stolen from Central City during Forever Evil. The future-Rogue sequences have some good heft to them, but they underscore in parallel the weakness of the present-Flash plot, which seems to mostly bide its time until the two Flashes collide. Venditti and Jensen seem to try to introduce new Flash rogues, but the constraints of the plot mean the audience only encounters these new villains via their weapons, not the villains themselves, and so it's all "flash," so to speak, without substance. Like Tom Swifties, the new rogues all have one-word names that suggest their powers -- Lasher, who uses a whip; Skipper, who teleports; Merge, who can merge objects, and so on. It's mundane, never did I feel like the Flash was really in danger, and Booth's exaggerated art contributes to this sense of "unseriousness." Again, that the defining future moments of Mirror Master, Captain Cold, and Trickster are so much more gripping suggests it's not worth the writers' time to try to reinvent the wheel. The writers do cleverly place the Futures End tie-in issue such that at about the time the future Flash arrives five years in the future, indeed the narrative has jumped five years to the future. The Futures End issue is no match for the Grayson issue in terms of writing, but I did appreciate that it continues the book's main plot, at least (whereas most of the Futures End tie-in issues could charitably be considered "Elseworlds," since they're basically incongruous with the Futures End miniseries proper). And obviously this Futures End tie-in issue ought have at least a little collector's value since it introduces, at least in some reality, the New 52 Kid Flash Wally West. Probably the brightest spot in Out of Time is the new Wally. The writers move awfully fast in giving Wally powers in the same volume in which he's introduced, and given that that's an "alternate future," I hope they slow way down even as I see Wally plays a role in the next volume, too. But I don't mind at all the writers positing Wally, once the world's biggest Flash fan, as someone who doesn't like the Flash at all, and Wally's love-hate relationship with Barry is a lot of fun. Even as we all already know Barry and Wally will be the best of friends one day, the schmaltzy scene at the baseball game still hit all the right emotional notes. And though I'm unsure about a white costume for Wally instead of his traditional yellow, the costume and "time-hopping Flash protege" put me in mind a bit of Impulse Bart Allen. I entirely think it's too soon for sidekicks in the no-longer-New-52 DC Universe, but I thought this Wally was Venditti and Jensen's best-written character. Would that I could say the same for the writers' Barry Allen. The book starts, unexpectedly, in the aftermath of Forever Evil: Rogues Rebellion, with Barry unusually depressed over his own absence during the Crime Syndicate's spree. It's a strangely dour note for a character that's usually optimistic even in the face of bad times (and out of place considering neither Superman nor Batman nor Wonder Woman are feeling the same). Forensic scientist Barry is a continual thorn in his Captain Singh's side in that he keeps finding new leads in cases Singh wants closed, but I found the writers' Barry kind of mopey and shrill such that I didn't really side with him against Singh in the way I know I was supposed to. The writers also continue, from Buccellato and Manapul's tenure, Barry's weird relationship with Patty Spivot. Despite being Barry's live-in girlfriend, Patty continues to play this third wheel role in Barry's life; all the important stuff happens with Iris West, and then Barry kind of seems to remember Patty when the day is done. Patty buys Barry a watch, in part to help him not be late -- which, she should understand, is not because he's actually late-late, but because he's constantly delayed by his work at the Flash -- and also to remind him of her, needy as that seems. Patty's neediness comes to the forefront at least twice more when she's jealous that Barry is off with Iris or that he makes time to be the Flash but not to be with her. This is silly; Venditti and Jensen are perpetuating the "superhero's wife/girlfriend just doesn't understand how important his work is" trope. But I maintain that this is Patty's lot in life; she's the safe choice Barry made instead of the risky, "anything for a story" Iris, and we can tell Barry's heart isn't in the relationship precisely because he does seem to find all this time for Iris and not for Patty. I thought Buccellato and Manapul got that and were positioning Patty this way on purpose; I'm not so sure if the new writers get it or if their depiction of Patty is just reflexively knee-jerk. When Batwoman Kate Kane dates Maggie Sawyer but then keeps things from her out of a misguided sense of protection, that's writers causing purposeful conflict in a relationship for plot reasons; I'm not so sure there's a plan any more for Barry and Patty other than Patty's a nag and Barry's got eyes for Iris, and that begins to feel tired to me (even as I can't quite look away). I don't know if the writers intend that the "Speed Force wound" is fixed after this book's climax or not, but I liked this idea that Barry can run fast -- say, from here to another continent -- but that he "loses time" somewhere on the return trip. This adds a curious wrinkle to the Flash's powers (kind of like Marv Wolfman's old post-Crisis plan where the Flash using his powers would bring him closer to death), and also codifies Barry's chronic lateness (which I maintain previously wasn't "lateness" at all) in-story. That's something I'd want to see explored further. Flash Vol. 6: Out of Time is OK as a New 52 Wally West origin, and not so bad even in the familiar territory of the Flash and his Rogues -- only, all of that's the future Flash and not the one we're supposed to be rooting for. I'm disinclined to stop following the DC Universe's Flash title, but I don't quite yet think I've seen what Robert Venditti and Van Jensen can do with the Flash Barry Allen proper; I'm hoping for better things next time around. Whether for the good or bad, Venditti seems to be a long term writer so I do hope his ideas get better if his run is going to be at least as long as Brian/Francis run. I wholeheartedly agree with your opinion on the new Rogues. I was reading the issues digitally when they first came out and I remember nothing about them.